Let's take a stroll back in time to 1971. As the Vietnam war was coming to an end and while the Cod War was still "hot," the U.S. Navy had 752 active ships of various types. You might note that this was down from 932 ships in 1968. To support the surface combatants and aircraft carriers, the 1971 Navy had 177 "auxiliary" ships, which included ammunition ships (AE), fleet oilers (AO), fast replenishment ships (AOE and AOR), stores ships (AFS), destroyer tenders (AD), and others. 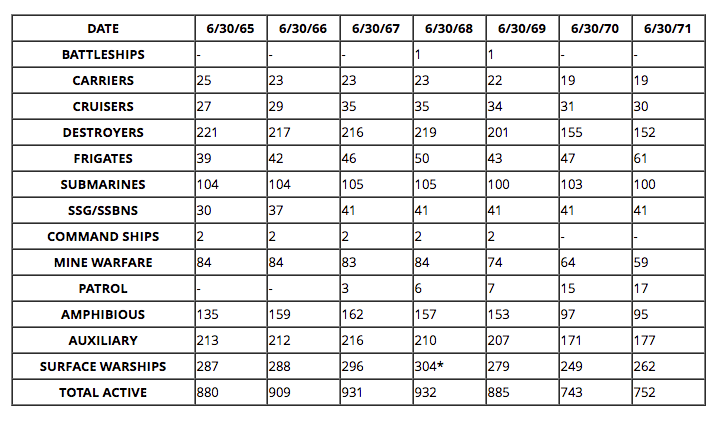 In June, 1971, the Navy counted 262 "surface warships." 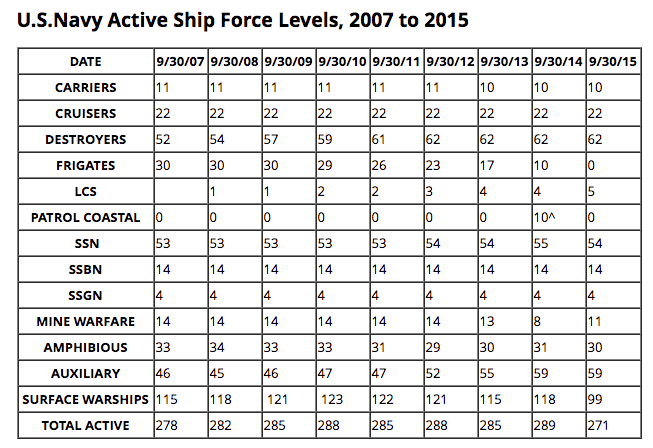 As you can see from the following chart, in September 2015, the "surface warships" of the Navy numbered 99. 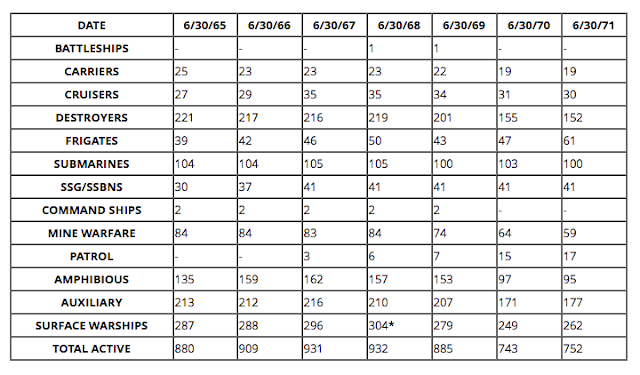 To clarify the ship numbers included in this table, the year 2000 entries include active commissioned ships, those in the Naval Reserve Force (NRF) and ships operated by the Military Sealift Command (MSC). Row entries are self-explanatory, with the auxiliary category including combat logistic ships (such as oilers, ammunition, combat store ships), mobile logistics ships (such as submarine tenders) and support ships (such as command, salvage, tugs and research ships). Command ships have been subsumed into that category and the separate line entry removed. A new row has been added for guided missile submarines (SSGN). 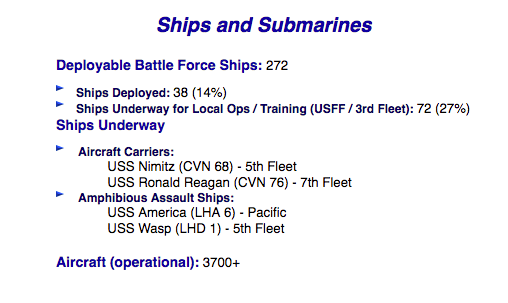 When the Navy offers up The Status of the Navy on its website, you have to understand that that"deployable battle force ships" category includes roughly 2/3 of the fleet that are not "surface warships." Certainly, the submarine force composes a warship category of 72 ships. Due to their unique abilities, these submarines are not dependent on the same sort of logistics train that is required by aircraft carriers and surface combatants. MSC safely operates, supplies, and maintains the ships that provide logistics support, conduct special missions, move military equipment, supply combat forces, provide humanitarian relief, and strategically position combat cargo around the world. MV SSG Edward A. Carter, Jr. The 31 ships in blue are capable of replenishment at sea. As such, they are vital to the "surface warships" and aircraft carriers of the fleet, as they allow those ships to remain at sea while conducting combat operations. The logistics ships provide food, munitions (including for aircraft), and fuel for ships and aircraft. parts, stores and small quantities of fuel. Replace T-AE, T-AFS and T-AOE when operating with T-AO. Two dedicated ships* provide ammunition, food, repair parts, stores and small quantities of fuel for the U.S. Marine Corps. Those dedicated ships are Sacajawea and Lewis and Clark. Deliver petroleum products, ammunition, food and other cargo to customer ships at sea. MSC's largest combat logistics ships. 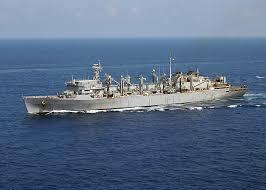 Provide underway replenishment of fuel, fleet cargo and stores to customer ships at sea. The question posed by Bryan McGrath quoted in the first installment of this series is whether this combat logistics force is large enough to support even our limited number of surface warships in a large scale conflict. One of the concerns is the vast distances that may need to be covered by a "train" of logistics ships if local supplies of food, fuel and munitions are not available. 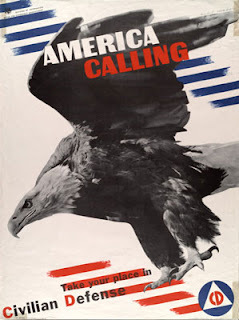 To circle back to those Vietnam days, the U.S. had a very large logistics base in Subic Bay, Philippines. 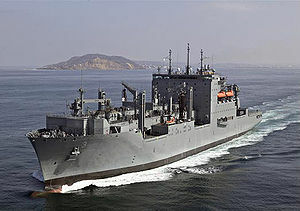 Subic was very short sail from the Vietnam coast, so a replenishment ship could leave the Gulf of Tonkin, go to Subic and be back on line within a week. 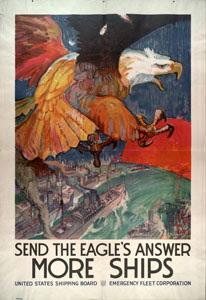 If those ships had have to transit to Guam, Hawaii or the U.S., the transit times would have been much longer and more ships would have been required to maintain the same level of fleet support that the logistics force provided during that war, which saw extensive use of both ships' guns and bombs from aircraft. While more recent operations probably have seen fewer bombs used because they are mainly precision guided weapons compared to the mostly "dumb" bombs of the Vietnam war, there has been virtually no used of naval gunfire in recent years. Instead, the Navy has used lots of missiles. 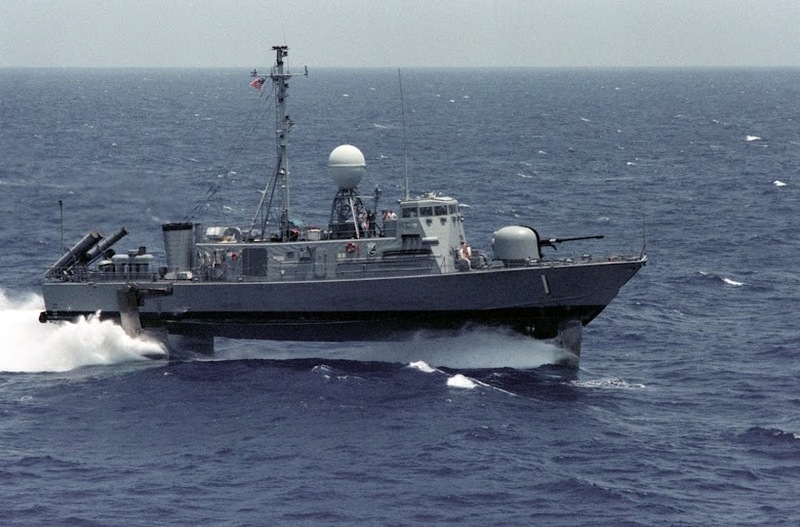 Replacements for expended missiles can be transferred at sea, but reloading the VLS cells at sea has not been a U.S. Navy skill set (see here). One of the advantages of the new rail guns that will someday introduced to the fleet will be that there will be no need for ships so equipped to carry more than the projectiles that the rail guns fire, and the space now needed for powder can be used for additional projectile storage. 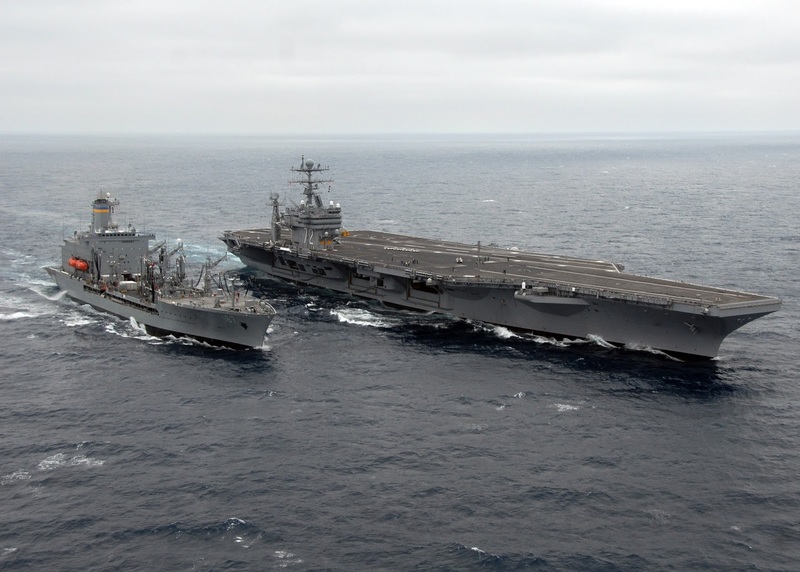 Propelling ships using nuclear power (carriers, especially) saves the need to refuel them, though their aircraft still need the oilers for their fuel (which is why you see oilers alongside carriers). Food and parts will always be needed. Two comments: CLF and MPS, while operated by MSC, are not under TRANSCOM COCOM but assigned by Navy to GEO COCOMs. Also, VLS missile re-arming is likely to be included in next budget submit because of concerns similar to those expressed above. However, having such a capability begs the question of missile inventory. Recall that DDG-1000 has a magazine of 600 rounds which would have cost close to $500M (the same price as a T-AKE)--and the magazine could have been expended in 30 minutes at max firing rate. That would have generated the need for a T-AKE to rearm it several times a day. However, we couldn't afford to buy even one ship set--and we thankfully didn't size the T-AKE fleet to support it. Buying additional CLF to fuel and rearm big deck aircraft needs to be balanced with funding of ordnance that it needs to transport.